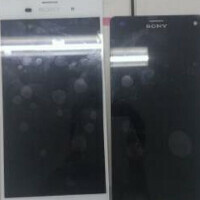 Pictures of the Sony Xperia Z3 and Sony Xperia Z3 Compact leak? With Sony sticking to its schedule, churning out flagship handsets every 6 months, we have a leaked photograph showing off an image allegedly showing both the Sony Xperia Z3 and the Sony Xperia Z3 Compact. There could be some similarities with the Sony Xperia T in terms of design. In addition, it would appear that the Xperia Z3 will have a metal frame. Both variants of the Xperia Z3 are unannounced at this point in time. There is some speculation that Sony will decide to use the Snapdragon 801 for the Sony Xperia Z3 and Xperia Z3 Compact, and wait for the Sony Xperia Z4 to use the 64-bit Snapdragon 810. The Sony Xperia Z2 currently offers a quad-core 2.3GHz Snapdragon 801. Sony could have decided to go with the Snapdragon 805 for the Xperia Z3, but decided against it, according to the rumor. We are jumping the gun. Three comes before four and you can check out what is rumored to be the Sony Xperia Z3 and the Sony Xperia Z3 Compact, by clicking on the slideshow below. Maybe it's a prototype . Doubt it will be the final design. A little trim on the top bezel Sony and it's all good. this cant be real..... thing looks like prototype from 2011. wait till august to get real leaks. They shouldn't even stick to 6 months cycle 9 months cycle would be perfect. Or 1 year. Is the z2 available in the US yet? Not really... You can get them from online retailer, but not through the carriers. i really wished to change the design only to not get bored also it's still great for e and alot but look at those bazzels!!!!!! I want a z2! To me it's the best of the current flagships. Now the bezels are actually acceptable. I thought the battery indicator was sideways and the dock was transparent for Sony's newer devices....? I say fake. Umm.. That's the Xperia T BTW. So what's the point of releasing a new version if it's going to have the same processor as the Z2? why isn't it in the us already when it's available? Fake! Just look the bottom of the display. Looks wear. Jeez, people commenting on absolute speculation! Like the article states 3 comes before 4, literally. Still those inane comments about bezels! Wtf!! Get a grip people....rant over. Clearly not even close to a flagship Z class. Look at the screen and see how the light bleed on top of colours, this isn't the quality standard set by the Z2.